It’s a new year and what better way to get it off to a racing start than with a review of Icon Engineering’s reinvention of the Porsche 917. Motor Authority calls it “one of the most insane automotive creations ever dreamt up by humanity,” and we’d have to agree. The 917 was once a legend of Le Mans and other racing circuits where it demonstrated speeds of over 240 mph in an era unaccustomed to such power. Now, UK-based Icon Engineering has recreated a fabulous replica of the 70s race winner and it looks like its designers and engineers had a real party when they went to work on it. 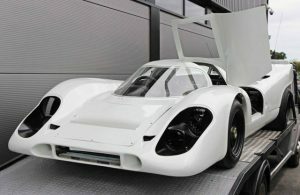 The replica is based on British racing driver David Piper’s original 917 built in 1969 and involved a five-year reverse engineering process. According to press reports, this eye-catching, mind-boggling model should be available some time during 2017, but no exact date has been announced yet. Unlike the original, the replica has been designed for both road and race track. It will look otherworldly on a race circuit, so you can imagine just how traffic-stopping it will be powering up a motorway or roaring around urban streets. Naturally, the engineering has had to go through some changes to ensure it meets all the rules and regulations for a street car. Fast and furious? It certainly has a large helping of Hollywood glamour. And, if you do want a version engineered just for the race track, then Icon can supply one. It has a fibreglass body shell and aluminium tubular structure, with a carbon fibre construction available for those drivers who would prefer it. The engine bay is built to accommodate the Porsche engine used in the original, but other engines can be fitted. Icon has even said that it may offer an electric version and that the engine bay is suited to housing a battery. It’s a turnkey car where the customer can dictate the ultimate engine and transmission configuration. 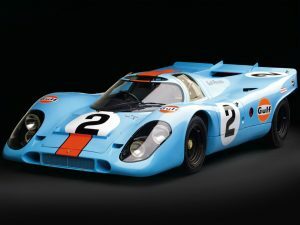 As Icon Engineering has pointed out to motoring journalists, you would be lucky to find an original Porsche 917 for sale and if you did, the price would be astronomical and in the range of “tens of millions of dollars.” At £95,000, or just over €100,000, this replica is certainly more affordable. If you want to rev up your 2017, then this might be the car to do it. Try out one of Titanium Luxury Hire’s sporty Porsches and experience a driving legend today! The luxury 4×4, or SUV if you prefer, continues to dominate the automobile industry and even the supercar manufacturers and designers are entering the market. Of course, there is one name that is still more famous than any other in this sector and that is Range Rover. This week we bring you the Range Rover Vogue. Its maker considers it the “ultimate in driving refinement and capability,” and we’d have to agree. The motoring journalists are fans as well. You can hire a Range Rover Vogue from Titanium Luxury Hire. Contact Us today! Well, 2016 has been a great year for new cars and the motoring journalists are quite excited about 2017 and the new models that are coming to market from family cars to luxury sports cars. The key trend for 2017 is the launch of yet more SUVs, which is a trend that just doesn’t seem to be dying down. Every manufacturer wants a slice of this market, but they haven’t completely moved away from producing models in the other motoring sectors and we’ll see some new hatchbacks and superminis amongst the new cars. We will also see some upgrades of existing models, especially in the luxury and executive cars categories including the BMW 3 series, the Audi A6 and Mercedes S-Class. At the everyday end of the market the Volkswagen Golf, Nissan Qashquai and Ford Fiesta are also set to have a whole new facelift. Of the cars that particularly interest the team at Titanium Luxury Hire, the new Aston Martin V-8 Vantage is high up on our list. This revamped Vantage will have some aspects of the DB11 but with the addition of the same 4.0-litre twin-turbo engine as the Mercedes AMG GT. In the executive saloon class, the Audi A6 is set to challenge the new Mercedes E-Class and the BMW 5 Series that will arrive in 2017. The A6 doesn’t look very different from Audis of the past, but the company says that the A6 is taking the range in a new design direction so that each model has a distinct identity. Other Audi models appearing in 2017 are the A6 Allroad, that has the usual features of an Audi SUV and this one features a petrol-electric hybrid drive system. The Audi A8 is a limousine and with many new ones showcasing cutting-edge technology, the A8 will demonstrate the latest autonomous driving software. The new BMW 3 Series is a seventh-generation car that will also have an all-electric version equipped to challenge Tesla. The new BMW 3 uses carbon fibre construction with a lightweight chassis and the electric motor is expected to achieve a range of about 300 miles. Ferrari will unveil the LaFerrari Aperta, which is a soft-top version of the LaFerrari hybrid hypercar. It has a carbon fibre top and fabric roof, plus its added body strengthening means that it is as a sharp to drive as the coupe version. This is just a small collection of what is coming, but at Titanium Luxury Hire we already have the best cars in the luxury car world and all you have to do is hire one from us and experience the delight of a supercar, a cabriolet, a 4×4 or an executive motor. It’s Titanium’s last car of the week for 2016 and where better to end it than with a Ferrari. This week we’ve chosen the stunning Ferrari F12 Berlinetta, which is yet another 12-cylinder stunner from the prancing horse stable. It is Ferrari’s fastest road car and if you want to zoom into 2017, this is the car to do it in. Contact Us now and we’ll have it delivered to you at any of our European locations. Experience it for yourself! Contact Titanium Luxury Hire TODAY and reserve your Ferrari F12 Berlinetta TODAY! Our Car of the Week was the Aston Martin DB9, so it seemed logical to tell you about the Aston Martin DB11, which is new to the market. Car and Driver magazine has said of the DB 11: “Like the best of its predecessors…fast, effortless and exciting.” Continuing the Aston Martin legacy, the manufacturer has paid great attention to the tradition of delivering beauty and power. It is a twin-turbo, 5.3-litre V-12 that generates an awesome 600 hp and does the usual measurement of 0-60 mph/99 kmh in 3.9 seconds. Other new models are following fast. In 2017 the new entry-level Vantage will debut with a V-8 engine from Mercedes-Benz, thanks to Daimler’s five percent stake in Aston Martin. This will be followed in 2018 by a top spec, two-door Vantage that Aston hopes will help to “build greater separation between the poles of Aston’s sports car line-up.” There will be convertible models of all three cars in due course. But, in 2019 we can look forward to one of Aston’s most ambitious gambles ever; the launch of the DBX crossover. The company also plans to relaunch the Lagonda name with a luxury executive style car to rival those made by Bentley and Rolls Royce. And, Aston is not stopping there, it is promising an all-electric car to rival those produced by Tesla. It may even produce a motor for Red Bull Racing. It’s an exciting time for Aston Martin and you can hire one of Titanium Luxury Hire’s fabulous range of Aston Martins right now. Why wait for the future! Titanium Luxury Hire allows you to simply enjoy all the fun and thrills of driving a luxury SUV/4×4 without any of the hassles. Plus, we’ll deliver the car to you at your home, your office, conference venue, airport or hotel in any of our extensive list of locations. All you have to do is Contact Us and tell us when and where you’d like one of our luxury hire cars.